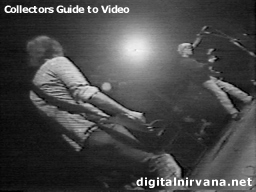 Nirvana started the year with the end of their club touring days. Later in the year, they played the summer festival circuit in Europe. Tapers could get nowhere near the band. 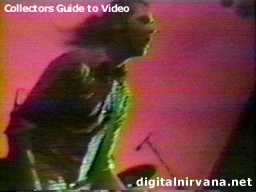 These videos foreshadow what audience bootlegs for the rest of Nirvana's career would look like, with few exceptions. From this point on, fans had to rely on pro shot concerts to get anywhere near the band. Notes: Good performance by band. They smash their equipment after TP. 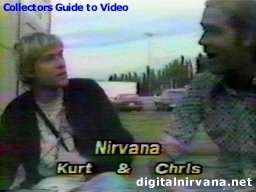 Krist and Kurt also kiss in the ending credits. However, the credits were retaped for future broadcasts, as apparently NBC was afraid people would be offended by it. 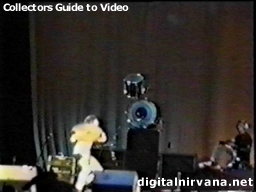 Kurt is not there, but Dave and Krist hug and fall down. 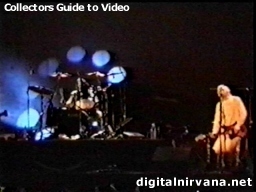 Notes:A screen can be seen where footage of the band is shown. Possibly a pro video exists of this show. Quality:This is circulating in really horrible quality. And as if the high generation copies aren't bad enough, the picture is an obstructed view, and the sound is terrible. The bottom half of the screen is obscured by the crowd. The heads of the crowd often block any view of the band. When you can see them, they are usually just visible between the heads of the people in front of the taper. 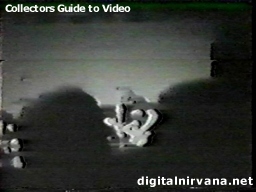 The video is often out of focus. Notes: This is the worst Nirvana video I've seen. The picture above is actually one of the best pictures I could get. Usually the picture is like this. Quality: The quality is just terrible. Notes: Negative Creep on ltso is from this show. 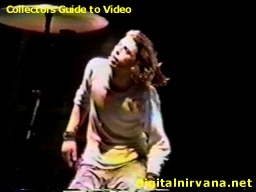 Quality:Shot from the left from a balcony or up in the seats, this video suffers from distance, as well as some really bright lights which tend to wash out Kurt. The sound is pretty bad, with the guitar buried in the mix. 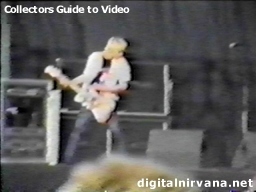 The copies of this video that are circulating are generated, and blurry. There are various cuts in the video. At one point the low battery light flashes and there is a cut shortly after. I'm not sure if the cuts in the video from lack of battery power, or if this circulating in a cut form. This is closest shot in the video. Mostly we see the whole stage, with some of the slightly closer shots thrown in from time to time. Notes:During Polly someone throws a bra up on stage. 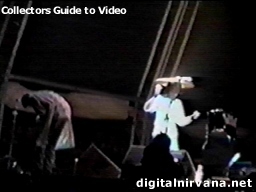 Kurt picks it up and says "My first bra". Dave urges Kurt to where it. When Kurt declines, Dave decides to wear it. 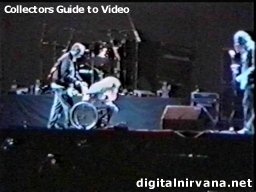 He comes out from behind the drums, and Krist helps him put it on. Notes:On a Plain can be seen on ltso but a PRO version hasnt surfaced. Shot from far back with some obstructions and not so great zooms. Quality:This is supposed to be closer than the version above, but is only 15 minutes long. 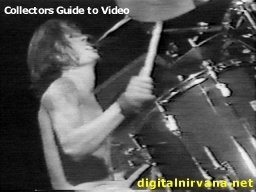 Quality:This footage can be found in the Swedish and Danish Nirvana specials. There is also an interview at the festival. Notes: Pretty ordinary show, quality is good but not great. Quality:The taper is on ground level, way back in the crowd. Not much change to get a decent video from his position. The copies going around are pretty generated, and blurry. The camerawork is pretty shakey. But that doesn't matter that much as there is no way to overcome the problem of the distance and the people in the crowd blocking the band. The sound is thin and echoey, pretty much what you'd expect from a festival tape. 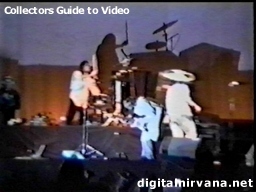 Notes: Krist is his usual self - jumping around, but Kurt doesn't seem very interested in the show. The only time he shows some life is when they play Love Buzz during the encore. Krist says some anti-whaling statements. The band asks the crowd not to clap during Polly, as people clap too fast and screw them up. People have been throwing water bottles on stage, one of which lands behind the drum kit. When they come out for the encore, Dave is drinking a big bottle of water. He tells the crowd they dont' need anymore bottles on stage because they have their own water. As soon as Dave stops talking, the crowd throws more water bottles at him. He jokingly asks them "do you speak english?" Quality:This is pro shot, but only 25 minutes were shown on UK television. Nice closeups, as well as some great shots of Dave. Always good to get shots of the drummer, since in audience tapes they are usually hidden behind their kits. Some of the footage is a little dark, but most is like this. 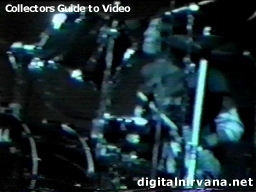 Quality:This is a closely shot video of the band, but the taper is at the edge of the pit, so it's quite shaky. But if you can handle the shakiness of it, there are some nice close shots. 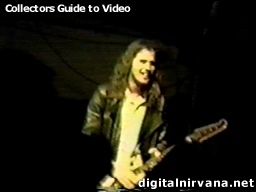 Even Krist and Dave have some good close shots. 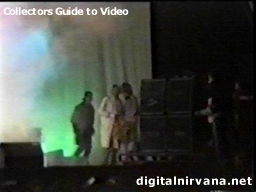 Kurts entry to the stage is missing from this video. This starts with Kurt in a wig. Tony, the guy who danced on stage at last years Reading Festival is here this year as well. 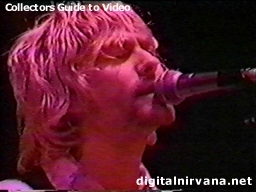 Sliver starts off with Kurt singing a bit off. He starts laughing, and shouts the rest of the first verse. Then he sings the second verse alternating between singing low, and screaming lines. Krist is very talkative. He tells a corny joke about the invisible man, and introduces tourettes by saying it's a new song "for all you bootleggers" called The Eagle Has Landed. The band does a fair amount of covers during this show. They start the show with Kurt singing a line from The Rose (Better Midler). 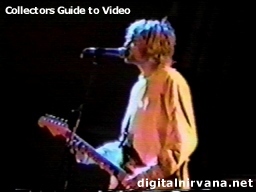 Unfortunately, this video is missing Kurts entrance. The band breaks into More Than a Feeling (Boston) with Dave singing the first verse before they slide into SLTS. Near the end of the show, they do a three song cover blitz, with their signature Love Buzz (the Shocking Blue), The Money Will Roll Right In (Fang), and D7 (the Wipers). Kurt even does a horrendous version of the US National Anthem ala Hendrix to close the show. 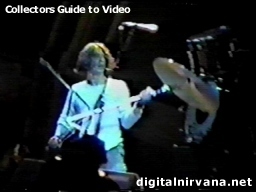 During SLTS, Kurt plays a random noise solo, and also does a random note solo during Love Buzz. 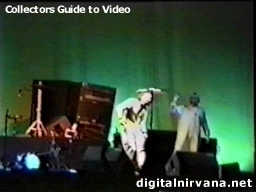 Kurt wishes Daves mom a Happy Birthday, while Krist shouts about the power of the bootleg. All Apologies starts with Kurt talking about Courtney and his twelve day old daughter Frances. He dedicates the song to them, and asks the crowd to says "Courtney we love you", as she thinks everyone hates her. 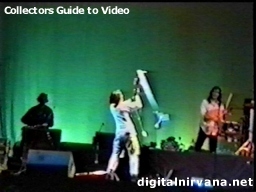 The end of the show starts with Kurt playing the US National Anthem, which turns into a wail of feedback. 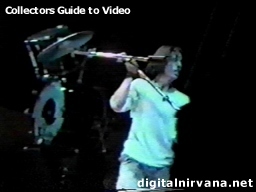 As Kurt is doing this, Dave stacks his drums on the amps at the side of his drum riser. 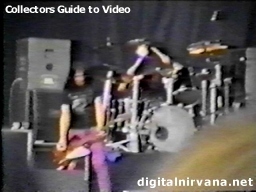 Kurt continues to play and Dave starts a systematic disassembling of his drum kit. He takes his cymbols to the right and puts them in front of the PA. Then he grabs more cymbols and brings them to the left side of the stage. Dave offers Kurt a cymbol to throw, but Kurt declines. Kurt keeps playing as the carnage goes on around him. Dave gets even more clever, and decides to wear a cymbol on his head. 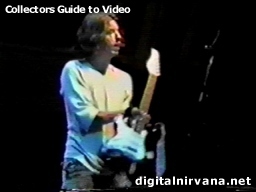 Kurt finally stops playing and Dave gets the guitar. He then decides to throw the guitar into the PA, which cracks the neck of the guitar. Dave picks it up and swings it around his head. 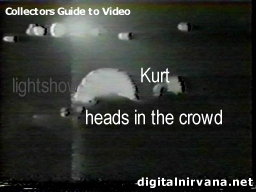 Things have wound down a bit by this point, and Kurt leaves the stage. Dave also leaves, and on the way off the stage, says goodbye by getting under the cymbol he set on the mic. Quality:This version was taped from the center further back and is fairly steady. The taper can't get close, as he's pretty far back in the crowd. The closest we get is two members of the band. The picture gets pretty shakey during In Bloom. The sound is okay, and the vocals are good. Dave is hidden behind his kit for most of the set. It's a rainy day and we get to see a shot of all the Reading mud. 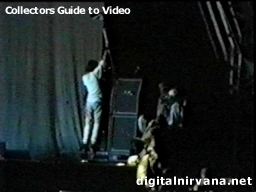 Notes: This video does have Kurts entrance to the stage. 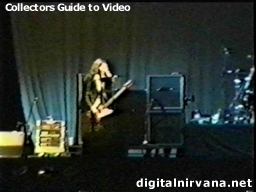 The show starts with Krist talking to the crowd telling them that Kurts not been well, but he's going to make it. Kurt is brought out in a wheel chair. 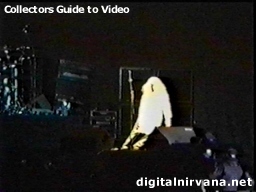 He is wearing a huge wig, and a hospital gown. He shakily stands up at the microphone, sings the first line from the Bette Midler song (and movie) The Rose, and falls to the ground. The show continues when Kurt gets up and starts singing Breed. Rather than repeat the same info about the show, see the entry for Reading #2 for more complete details. As this was shot from straight on, we get a different look at the destruction at the end of the show. 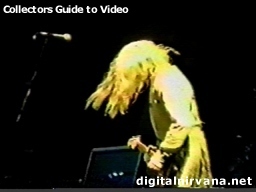 At the end of Territorial Pissings Kurt knocks over the amps. 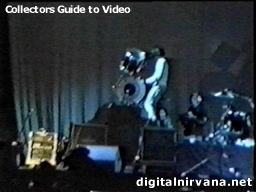 Dave decides to dismember his drums, and starts by balancing his drums on the PA. He then takes his cymbols and puts them on the PA. 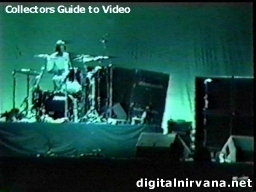 While Dave is taking apart his kit, Krist gets behind the drums that are left, and starts hitting them. The band each continues with their own thing. 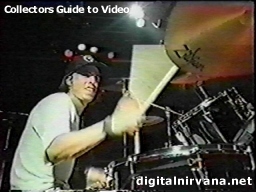 Dave grabs more cymbols, and throws them at the balancing drums, knocking them over. 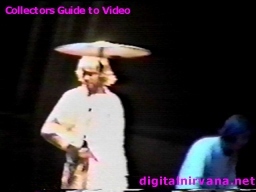 Kurt bends over playing noise, Dave walks around with a cymbol on his head, and Krist keeps playing the drums as the Dave wears a cymbol on his head. 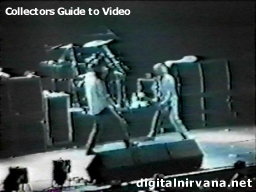 As Kurt finishes with the guitar, Dave grabs it and throws it into the PA. He then picks up the pieces of it, still strung together with guitar strings and the guitar strap, and swings it around his head. 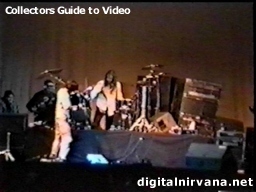 With the destruction of the stage complete, Kurt waves, and Dave gets under the cymbol on the mic to say goodbye. 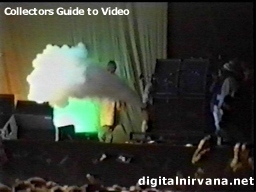 As Kurt stands at the edge of the stage, Dave sets off a fire extinguisher. 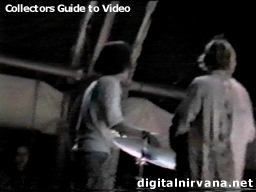 When the smoke clears, we see our last shot of Dave and Kurt before they slip backstage. Notes:This video is infamous for two reasons. 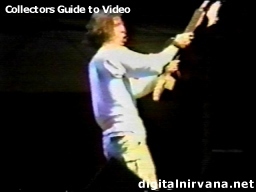 First, near the end of the song, Krist tosses his bass up in the air, but when he tries to catch it, it hits him in the head, knocking him to the ground. 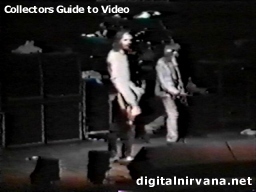 Second, at the end of the song, Dave goes up to the mic, and says "Hi Axl", referring to Guns N Roses, Axl Rose, who had a confrontation with Kurt and Courtney earlier in the day. Quality: The version that's been circulating is not that great. There are some glitches and some of it appears as black and white. The colored parts are a bit washed out. This is a local access show, and was only shot with one camera, which was on the left side of the stage. 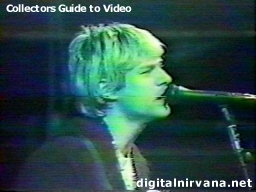 There are good shots of Krist and nice close ups of Kurt. Notes: This footage is from the No on Nine Benefit. There are great shots of the band, and once again, Dave gets some good shots. The band is also interviewed backstage. Clips can be seen at the end of ltso. Quality: Shot from back in the crowd toward the right side of the stage, this looks nice. The shot is never closer than head to toe, but we can still see the expressions on Kurts face. Notes: Kurt played two songs at this show. The first was a solo performance on acoustic guitar. Next he played one song with Mudhoney. 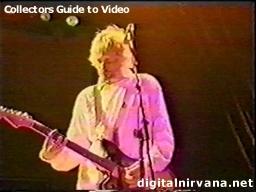 At the beginning of the song, they seem to be telling Kurt what chords to play. 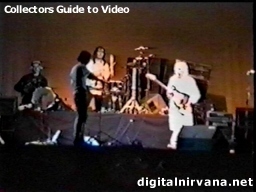 Also of note is that Kurt performs in pajamas and a cardigan. 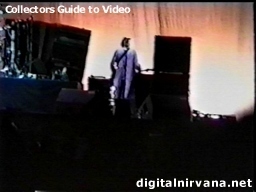 Audio bootleg sources are from this video.